Founded in 1872, Greenville, NH has the distinction of being both one of the state’s smallest and newest towns. Interestingly enough, this cozy town’s population has only about doubled in size from the 1880 U.S. Census. Located on the Souhegan River’s High Falls, residents first took advantage of the flowing water to run a mill. School children in Greenville attend Mascenic Regional from Kindergarten through twelfth grade, a district that also includes Mason and New Ipswich. Even though Greenville, NH only consists of about seven square miles, there are still quite a few local pests that might plague residents from time to time. Carpenter ants can chew through the wood frames of your house and in time, they may cause structural problems that are tough to fix. If you see small piles of sawdust around your home’s foundation, you should call for help to check for carpenter ants, termites, or other wood-boring pests. Other types of ants might not bore through your home’s frame. Still, many kinds of ants bite. Others feed upon the plants in your garden or landscaping. Professional pest control technicians can offer you safe and nontoxic solutions to get rid of all types of ants. Nobody wants these aggressive insects around their homes and families. In the best cases, their stings are painful, and in a worst-case scenario, someone might suffer a severe allergic reaction. If you find a nest of wasps, you should seek professional assistance before you try to remove it alone. Some familiar places to look for nests include attics, on the ceilings of front porches, and under eaves. Opportunistic rodents may enter your home through very tiny holes or even through unsealed drains. They carry diseases, and they also breed faster than most homeowners can get rid of them. Professionals can help evict these unwanted pests before they establish colonies behind your drywall or in the attic. 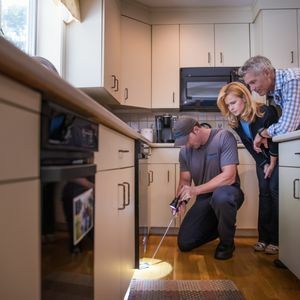 It’s easy to miss the small holes or cracks that pests can use to get inside your home. Keeping your home clean won’t always deter insects or small mammals, because many of them are simply attracted to light or warmth. At one time or another, most homeowners need help to rid their homes of infestations. It’s important to act promptly because many of these creatures can injure people, spread diseases, or destroy your property. At Colonial Pest Control, we work as partners with our Greenville, NH clients to help prevent and remove pest infestations. We can offer you sound suggestions to help keep unwanted critters out of your home. We also have safe solutions that help chemically deter invaders. If you have concerns that unwanted insects or small animals have sought shelter or food inside of your house, call upon us for quick, nontoxic, and effective remedies. Just call 1-800-525-8084 to ask questions or schedule a visit. I've been using Colonial Pest for 15 years. They have always been responsive to my needs. If I have an issue with any pest after they have come to spray, they are always willing to set up another appointment to rectify the problem. Their staff has always been professional and competent answering any questions I may have. Thank you.